Our Server Functions Challenge has only 12 days left. Details here. 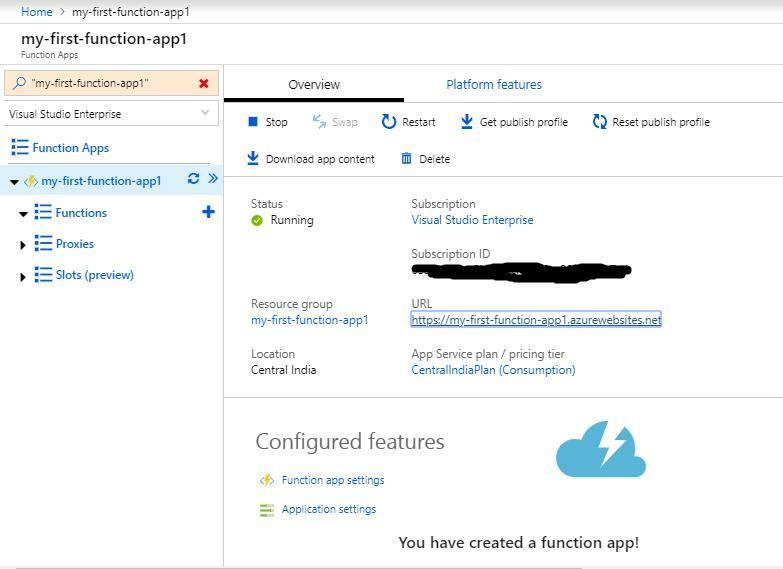 One of the quickest way to get your code up and running in Azure is to use Azure Functions which makes use of the serverless architecture. When we say serverless, it means that we don&#8217;t have to worry about the provisioning and maintaining of virtual machines or servers. One of the quickest way to get your code up and running in Azure is to use Azure Functions which makes use of the serverless architecture. When we say serverless, it means that we don’t have to worry about the provisioning and maintaining of virtual machines or servers. We just write a function and Azure takes care of finding a server to run it on. The server is abstracted away from us and we can focus more on implementing the business logic than worrying about the servers and their maintenance. Azure functions also offers a consumption based billing model so we only pay when our functions are actually running. Azure functions are also scalable. If there is greater load, azure functions will automatically scale to multiple servers to meet the demand. All this happens automatically without any manual intervention. Apart from triggers, Azure functions also support different type of input and output bindings which makes it easier to integrate with other services. If you want your function to write to table storage, you can use a Table storage output binding. The binding take care of sending the data to the table storage and you only need to define the message that you want to store. Similarly input bindings enables you to read content from EventQueue, CosmosDB etc without writing any boilerplate code as the binding takes care of that. This saves a lot of time as you can focus more on implementing the business logic. 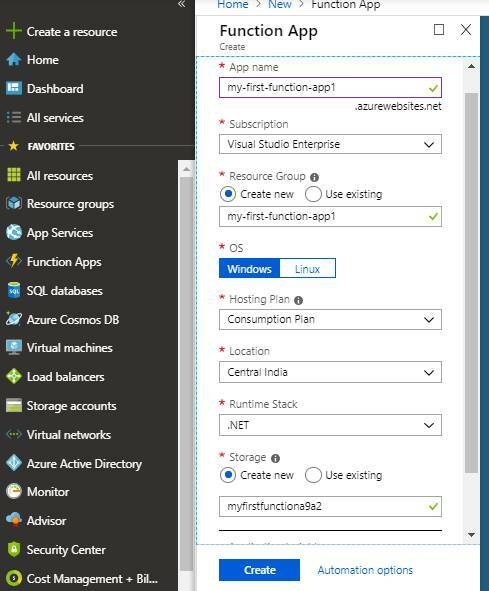 There are different ways in which we can create an Azure Function App. You can create and test them directly using the Azure Portal. You can also use Visual Studio 2017 to create Function App. Visual Studio provides a lot of different templates that can be used and it also allows debugging and testing the functions locally. We can also use “Azure Function Core Tools”, a set of command line cross platform tools which can be used to develop function app without any IDE and in different platforms. Visual Studio Code can also be used to develop function app using the Core tools. 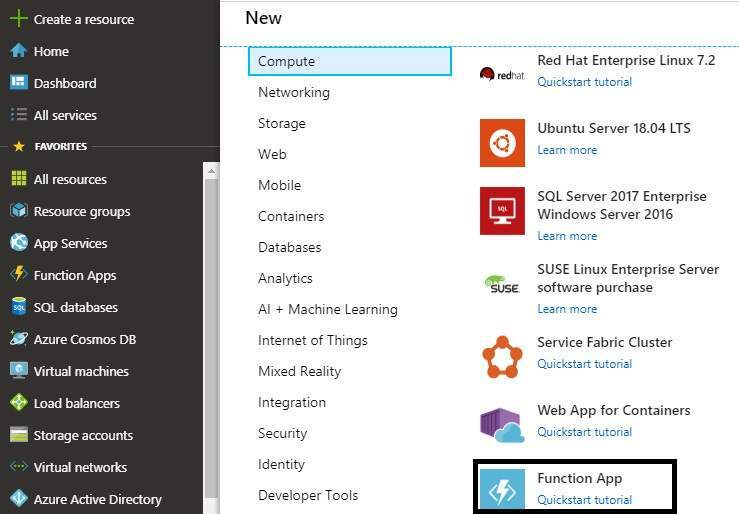 In this post, we will see how to create a function app using the Azure Portal. You will need an active azure subscription. If you don’t have one, go to this link and you can register for a free azure account which allows you to use azure services worth $200 free for 30 days. In the Azure Portal, go to dashboard, click ‘Compute’ and select ‘Function App’. Select the “WebHook + Api” option as this will enable us to call the function using an HTTP request. Click on Create. Azure will create the function and will generate some default code for the same. The in portal editor will also open where you will be able to modify the code. The default code is quite simple. It looks for a name parameter in the query string as well as in the request body. If the name is present, the greeting is displayed else you will get the bad request response. Now as the default function app is created, let’s see how we can call the same. Click on the “Get Function URL” and copy the URL present. If you look at the URL, it will contain the function app path along with the name of the function that you are calling. It also contains a query parameter “code” which is an access code which you need to pass while calling the function. This is used for authentication. Enter the URL in the browser and hit enter. You will get a response saying “Please pass a name on the query string or in the request body”. As the function expects a name, we will need to pass the same in the request. Add the “&name=John” to the end of the URL and hit enter. Now you will get “Hello, John” as a response. Great, you just created your first function app that responds to Http request. Thought it doesn’t do anything useful, you got an idea how easy and quick it is to create a function app in azure without using or installing any tools. Also we didn’t have to provision any infrastructure as Azure is taking care of the same. And with the Consumption plan, we only pay when our function is executed. In my next article, we will take a look at how to create the Function App using visual studio that uses different triggers and also interacts with other azure services. Madhur is Technology Lead by profession having around 9+ yrs of experience in IT industry working on Microsoft Technologies. Apart from Microsoft Technologies, he also likes to work on Mobile Development in Android. His Technical expertise include .Net technologies including MVC, WebAPI, Azure. Apart from coding, he like to play Xbox Games, strum guitar or read books. Could have been described with practical examples and usecases. Azure is an overload of possibilities. It's always nice to read a straightforward and simple demonstration of one of its features in under ten minutes. Thank you for taking the time to put this together.